I’m a proud Tuxie. I’m also proud of my Russian Blue furs. When I first started blogging, I tried to join that Tuxedo Cat Hideout or whatever it’s called. Apparently, they didn’t want me or I didn’t fit in or something. I said hiss on them. I always secretly wanted to join the Tabby Cat Club. They were active unlike the other kitty clubs. There’s always something fun going on at the TCC and this ghetto kitteh is all about fun. Nicky, the cat who came before me, was all tabby. One night, TW was taking pictures of me, using only a flashlight for light. 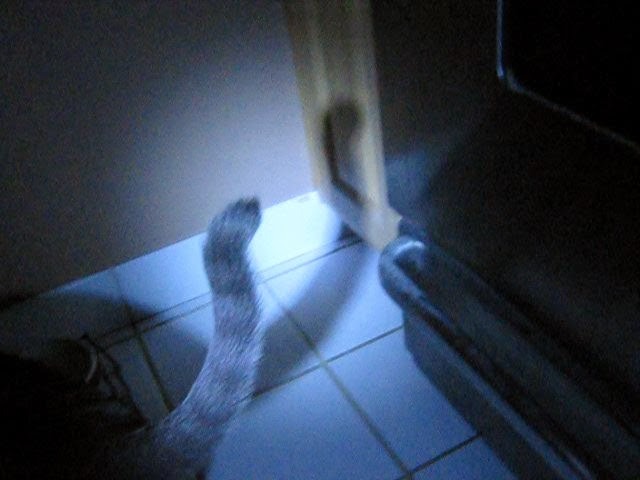 When we put the pics on the computer, we noticed I HAVE TABBY STRIPES ON MY TAIL! We immediately sent the pic to the TCC and showing their extremely good taste, they said I could join. Thank you Gracie and Raz for welcoming me with open paws. Without further doo-doo, let me present my tabby stripes! Why would you want to join a club that is so stuffy anyway. You are too cool for them. I don't have any tabby markings, except for the M on my forehead. As a Somali cat, that is a good thing - it speaks for my breeding! As a tabby cat, it means... well, I don't have the qualifying stripes. Yay CK! I remember when you posted your stripes before but I am glad you got to join the club! Honey Delite was a member of the club. But right afterwards she went missing :( I still enjoy looking at all the tabby cat posts from friends though. It's a great club. Lovely in all your Tabbyness CK.Have a fabulous Friday. Oh my goodness! Aren't those adorable! In certain light, Leo has stripes on his thighs! Stands to reason though, his mommy was a tabby and white and all of his sisters except the tuxie have stripes. We're so glad you got into the TCC! I'm in the TCC CK so I'm mighty happy you are too! They do a lot of fun things in the TCC so you're in the right place for that. WTG, CK! We are the slackingest members of the TCC ever, but we welcome you to the club anyhow. We're sure you'll have lots of fun. The club is always doing all sorts of stuff. That is really cool CK. Guess I'm stuck with being just a Tuxie as my black is about as black as black can get!. Have fun! You has lovely stripes CK. We are going to have to get a picture of the stripes on Scylla's tail one day. She is a tabby too as well as a dilute calico. Wow, CK...we never realized you had stipes! Welcome to the TCC. Ernie says he's a little jealous because he doesn't have any stripes and can't join. He's thinking of painting some stripes on himself. Clubs are fun...Truffles is a member of the Ladies of Autumn. Yeah! Those are some really awesome tabby stripes on your tail, CK! I'm so happy you're part of the TCC now. It's a great group of kitties, and we always have so much fun. That is a Tabby Tail, alright! Welcome to the TCC, CK! ck...we due see sum tabby stipes on yur tuxies tale sew ewe iz now an o fish ull tabby tailed tuxie Russian blue tabby tuxedo tabby cat..say that fast ten tabby times N win knot ten but twenty tons oh toona !! !hope ewe haza cod kinda caturday anda salmon samich sunday !! You have the best of both worlds there, CK. Tigger belongs to the Tabby Cat Club, but he is too mysterious to pawticipate much!! What? The Tuxedo Gang turned you down??? HISS on that for sure. 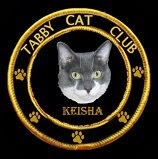 Good for the Tabby Cat Club for welcoming you. George sends a high wing. You are tabby stripe cool CK!!! Imagine anyone refusing a stunning cat like you entry to anywhere! With your Russian Blue heritage I reckon that makes you feline royalty. Glad you earned your stripes tho'. MOUSES!! I am so gonna have to get a photo of my tail!!! I am totally SURE I have some stripes!!! Thanks BFGF!!! STEALTH Tabby. We like that! Waffles has submitted his official application. Me thinks yous is beautiful not matter if yous a Russian Blue, a Tuxi or a Tabby or just a ghetto kitty. WELCOME to TCC , CK ! 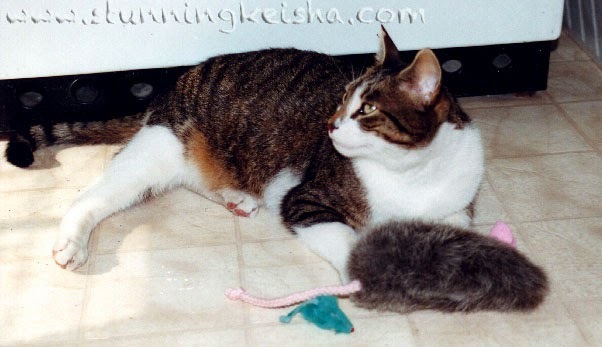 Your tail is furry Tabby striped indeed !